Let’s take a trip back in time, shall we? Back to a quaint time, called…the nineties. Like, the 1990s. I love Martha Stewart. Have I mentioned that? At least, I love her ideas, and how she transformed gracious, beautiful living into something everyone wanted to embrace. 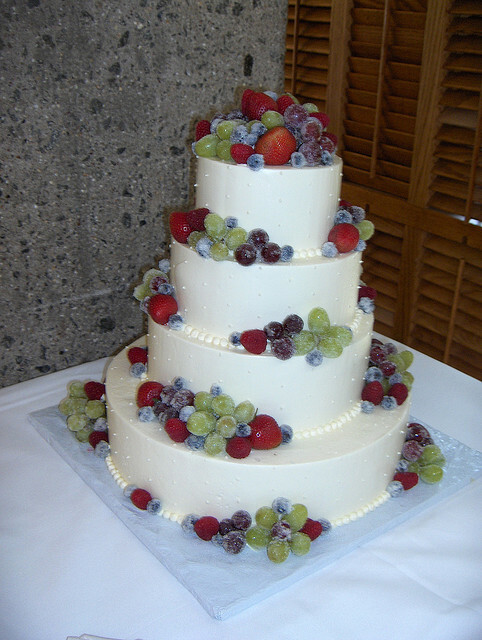 And one of my very favorite ideas that I gleaned from Martha was the use of fruit or flowers to embellish and garnish cakes. Now, I realize she didn’t invent the practice, but I believe she certainly went a long way to make it popular. One of my most favorite ideas of hers is to “frost” fruit. This is a very simple technique of coating fresh fruit (or even flowers) in a very sparing layer of egg white – even brushing it on with a paint brush – and then rolling the fruit in a shallow dish of superfine sugar. It makes for a stunning display, and it’s so simple and easy. Cranberries are especially beautiful when frosted, but another fruit that lends itself to the technique are grapes. I show you this cake, especially because of the frosted grapes. I think the baker did an excellent job with the perfectly smooth, white buttercream, and the flawless, though simple, dot design. But the frosted and fresh fruit truly sets it apart, and makes it original. And, in my opinion, infinitely more, well, refreshing. And inviting. And now, if you’ll excuse me, I have a sudden and very strong craving for a big bowl of summer-sweet fresh fruit.